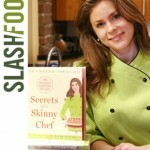 In my interviews last week with Slashfood’s Nicki Gostin as well as Julie from Booking Mama, we talked about the philosophy behind Skinny Chef, touching on what makes my cookbook different from the million other diet cookbooks out there. I want to send out a big thank to the entire team at Satya’s for hosting my New York City cookbook launch for ‘Secrets of a Skinny Chef’. In honor of last night’s menu, I wanted to share some ways to adapt meat-centric recipes for my vegetarian friends. Wild rice, also called ‘Indian Rice’ is the seed of an aquatic grass. 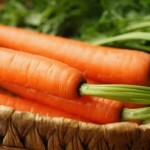 Much like whole grains, it contains protein and is high in many vital minerals. 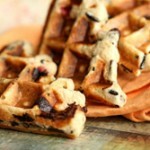 That’s why I developed a recipe for Wild Rice Waffles for one of my recent posts on Slashfood. Visit my dedicated site to feature the book, giving readers five fabulous resources to transition effortlessly to a new eating and cooking approach that will bring lasting benefits. Who says you can’t have your cake and eat it too? Please join Beth and Satya of ‘Satya Jewelry’ on Thursday, March 25nd from 5-8 pm to celebrate the launch of Jennifer Iserloh’s first cookbook, Secrets of a Skinny Chef. 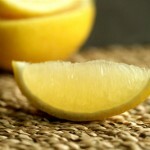 Many people love to eat fish, but feel stuck with the same preparations and same sauces all the time. 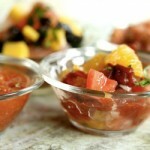 Why not ‘flavor-boostâ€ your fish next time around with one of my four fast and easy sauces? 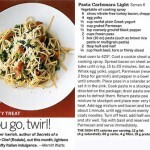 Self Magazine included in their March 2010 issue my ‘Pasta Carbonara Light’ recipe from my first cookbook – now you can have the lighter side of delicious with all the same flavors, plus peas and fresh basil!